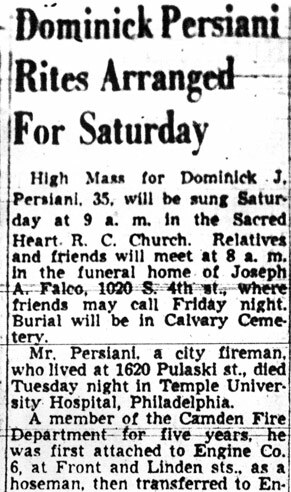 DOMINICK J. PERSIANI was born in New Jersey in 1918 to Caesar and Alma Persiani. The 1920 Census shows the family, which then consisted of Dominick and three older sisters, living at 311 Division Street in South Camden. Dominick Persiani received a grammar school education and then went into the workforce. The 1930 Census shows that he was living with his parents, Cesar and Alma Persiani, and four siblings, older sisters Anna and Mildred, and younger siblings Barbara and John at 420 West Street. His father was then working as a butcher. The family moved to 231 Washington Street during the 1930s. In the time between the April, 1930 census and the 1940 Census, Dominick Persiani married, and worked as a sheet metal worker. The 1940 Census shows him and wife Carmela at 223 Washington Street in Camden. The Persiani's later moved to an apartment at 301 Penn Street, where they were when, in 1943 he was inducted into the United States Army. 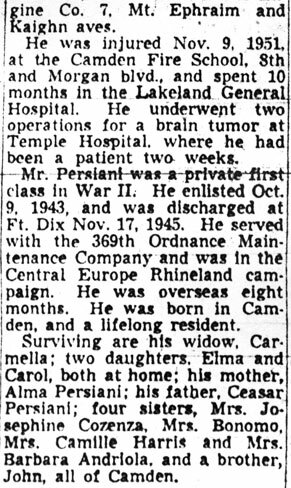 On October 9, 1943 at Camden Dominick Persiani was sworn to service, leaving his wife Carmela behind to serve his country. Assigned to the 369th Ordinance Maintenance Company, he went overseas in March of 1945. After serving in the Central European campaign, he returned home and was discharged at Fort Dix on November 17, 1945. Returning home after the War, by 1947 the Persianis were living at 327 Division Street. He was then working as a mechanic. 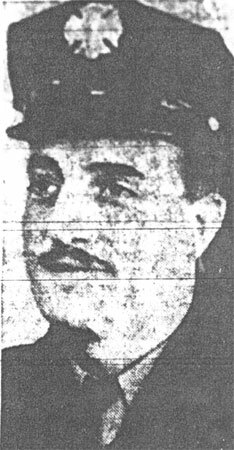 The following year, Dominic Persiani joined the Camden Fire Department and was assigned to Engine Company 6 at Front and Linden Streets, as a hoseman. In 1951 he was transferred to Engine Company 7, based at 1115 Kaighn Avenue. The family later moved to 1629 Pulaski Street.